After a successful first year in 2016, Driftwood at Doheny State Beach expands to two days for Veterans Day Weekend 2017 in Orange County, CA. 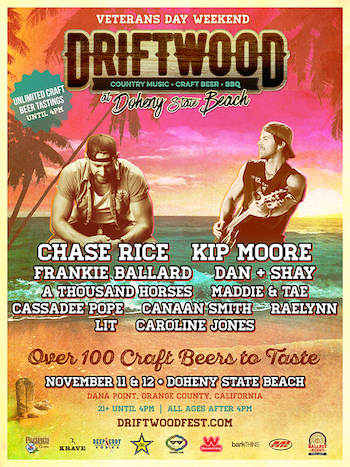 Driftwood will feature country music, California-focused craft beer, and top notch BBQ at the scenic Doheny State Beach in Dana Point, CA on Saturday, November 11 and Sunday, November 12, with performances from Chase Rice, Kip Moore, Frankie Ballard, Dan + Shay, Maddie and Tae and more. Produced by premier music festival production company Synergy Global Entertainment (SGE) and Orange County, California's most successful and respected craft beer festival producer Brew Ha Ha Productions, Driftwood at Doheny State Beach will feature over 100 craft beers and some of the best BBQ in the region, along with music from top country music artists. Chase Rice explains, "We love sharing the new music with our fans at festivals like Driftwood because the energy [of the crowd while on stage] is exactly why we got into music in the first place. A lot of the creativity that went into this new album was inspired by our fans and moments like those we have on stage…we can't wait to share that experience with such an incredible setting. Craft beer and Country music, it doesn't get any better." Cameron Collins, Co-Founder & Director of Events at Brew Ha Ha Productions said, "Driftwood was so well received last year that we're bringing it back this Veterans Day weekend for two days of the best craft beer, country music and BBQ ever to hit the Pacific coastline!" A very limited quantity of specially priced Early Bird tickets for Driftwood at Doheny State Beach will be available from Wednesday, July 12 at 10:00 AM PT through Friday, July 14 at 9:59 AM PT, while supplies last. 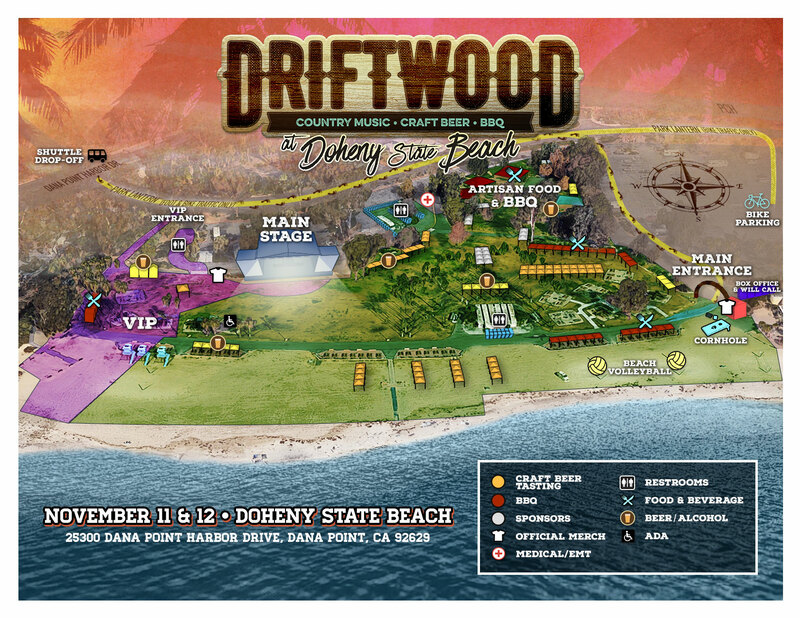 Sign up at www.DriftwoodFest.com to receive a password to purchase Early Bird tickets. Regularly priced tickets go on sale on Friday, July 14 at 10:00 AM PT. 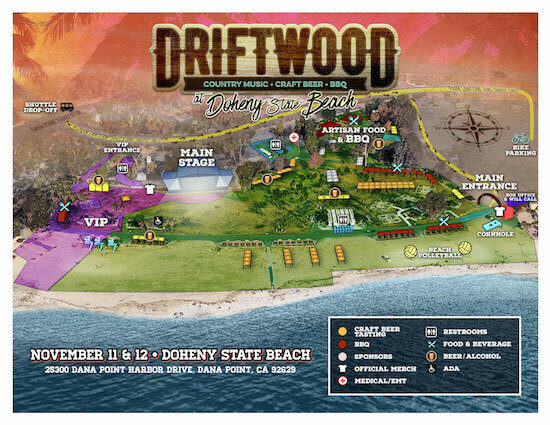 Driftwood at Doheny State Beach kicks off at 1:00 PM each day, with VIP early entry beginning at Noon. Festival attendees will choose from over 100 craft beers to taste until 4:00 PM (for those 21 and up), and will have the chance to enjoy the best of California's BBQ. Three hours of unlimited craft beer tastings are included with admission. After 4:00 PM, fans under 21 years old are welcome. Music lasts until 9:30 PM on Saturday and 9:00 PM on Sunday. Craft beer, wine and cocktails will be available for those 21 and up to purchase throughout both days. Festival attendees will be able to roam throughout the lush grass areas of Doheny State Beach, right off the shore of the Pacific Ocean, touching the sand. The initial list of participating breweries includes: Chapman Crafted, Noble Ale Works, Bottle Logic Brewing, Modern Times, Pizza Port, and Beachwood Brewing, with many more to be announced. General Admission and VIP tickets will be available for purchase for the following prices. All tickets include craft beer tasting and access to view the music stage. Shuttle passes are available for only $10 per person, roundtrip. Parking is available (first come, first served) at the shuttle pick up at the Outlets at San Clemente (101 W. Avenida Vista Hermosa, San Clemente, CA 92672). Shuttles will run every thirty minutes from 11:30 AM — 10:00 PM between Outlets at San Clemente and Doheny State Beach. The shuttle will be free for active and retired military with ID. Visit www.DriftwoodFest.com for details. Free bike parking will also be available at Doheny State Beach. A portion of the proceeds from Driftwood at Doheny State Beach will be donated to the San Onofre Parks Foundation—a California non-profit that cooperatively works with the California State Parks to develop, preserve and enhance the recreation and experience of California's unique and beautiful coastal parks—and the Doheny State Beach Interpretive Association (DSBIA), the non-profit cooperating association of Doheny State Beach, dedicated to the protection of the park's beaches, facilities, marine refuge and its historical, cultural and social stories. Doheny State Beach is easily accessible by car from Los Angeles County, San Diego County, the Inland Empire, San Francisco, Las Vegas, Phoenix, Tucson, the San Joaquin Valley, and via flights to Orange County's John Wayne Airport. Sponsors for Driftwood at Doheny State Beach include Pacifico, Ballast Point, Deep Eddy, Rockstar Energy Drink, Musicians Institute, Cosmic Fog, Weinerschnitzel, Krave, Bark Thins, and more. Synergy Global Entertainment, Inc. (SGE) specializes in producing music events and music marketing programs benefitting brands, artists, consumers, partners and attendees alike. SGE has produced thousands of branded music festivals, concerts, tours and events throughout the world playing to millions of applauding fans. Brew Ha Ha Productions (BHHP) is California's most successful craft beer event producer and creates award winning, often sold out, events. Its team brings years of successful event production and business experience along with an inside view of the craft beer industry and its enthusiasts. Fueled by a desire to promote craft beer, along with a vision of creating legacy beer fests and events, BHHP was conceived 10 years ago. BHHP produces multiple celebrated festivals with rave reviews annually including BruFest in Phoenix AZ, 91X's BEER X in San Diego, Driftwood, Ye Scallywag and more. Best known for their signature events like the OC Brew Ha Ha Craft Beer Roundup, Brew Ho Ho 'Holiday Ale Festival', Sabroso 'Craft Beer; Taco Festival' and the award winning Brew Hee Haw at the OC Fair, BHHP is now expanding events to other cities and states including Arizona, Washington and Idaho to enhance communities with fun and safe events along with helping to raise money for local charities.